Maverick entertainer and rights activist, Charles Oputa, popularly known as Charlyboy, has formally tied the knot with his American wife, Diane, after 40 years of marriage. 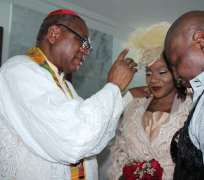 Charlyboy, who has earlier stirred reactions after he announced he was divorcing, exchanged marriage vows on Saturday evening at the Chapel of Sisters of Jesus the Redeemer Catholic Church in Gwarimpa, Abuja. On why he decided to get married, Charlyboy told NAN that he and his wife decided to wed in church to honour his aged mother who had been ‘pleading that we do the right thing’. He told NAN that he got married as a teenager in 1974, and secured divorced after the union produced one child.